We spent part of Spring Break at Omaha's Henry Doorly Zoo. 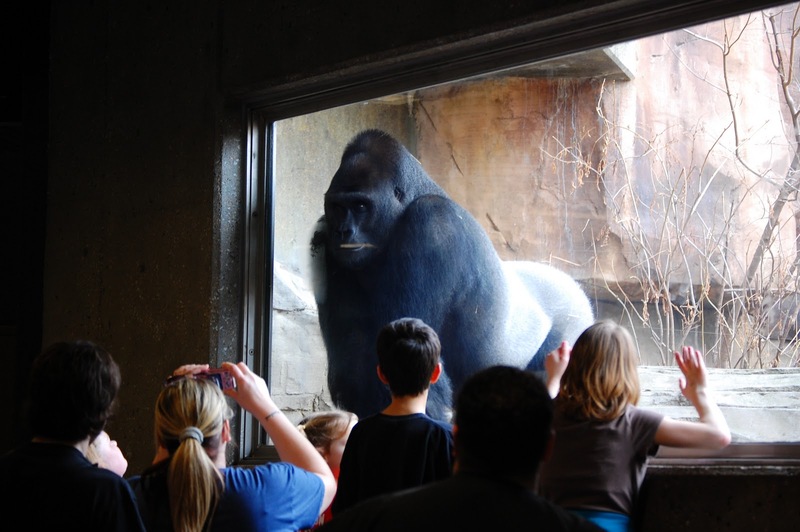 The gorilla exhibit is always interesting, and the gorillas seemed quite interested in their visitors. One has to wonder...exactly who is watching who, here? Zoos have a special role in conservation. A conservation biology textbook notes that more people go to a zoo, annually, than attend all professional baseball, football, basketball, and hockey games (combined). Wildlife biologists are quick to point out the role that hunters and fisherman have played in conservation, through their monetary support of conservation and habitat efforts. But, I don't think you can count out the millions of zoo lovers, either--the majority of the folks at the zoo in Omaha were moms with their kids. The same textbook informs that almost 50 species of animals and plants (worldwide) are still on the earth because of ex situ (off-site) conservation efforts in zoos or aquariums.